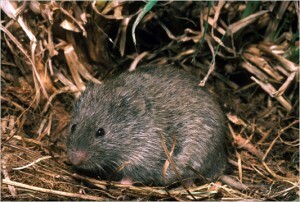 The prairie vole is a type of small vole found in Central North America. Apart from that,this species of mammal is widely found throughout the Midwest. They are basically seen in upland fields and grasslands and they prefer building underground runways along with the other voles. There are approximately 155 species of voles found throughout the world. In North America, they are popular as meadow mice or field mice. 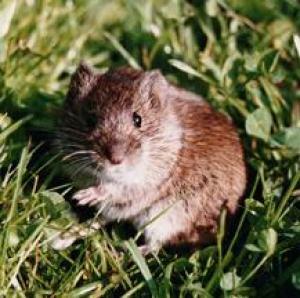 Voles are identified by their short ears and short tail and yellowish fur on the lower part of their body. There are actually three subspecies of prairie vole in South Dakota. Body : They usually have stocky and stubby body with a short tail and four short legs. Size : They grow somewhere between 5 to 6.75 inches in length. Weight : They has an average weight of 67 gm. Eyes and Ears : Their eyes and ears are quite small. Color : Their colors vary from yellowish brown to reddish brown to blackish brown. Mainly they are gray on their under parts. Prairie voles are found in grasslands in the Central United States and Canada. Their distribution ranges from east of Rocky Mountains to West Virginia. This species are also seen throughout South Dakota as they prefer the upland prairies of South Dakota. This species prepare shallow underground burrows and runways via surface vegetation. They prefer living in the burrows because they feel safe inside those burrows. In winter, they tunnel underneath the snow. They also prefer inhabiting in drier areas. Prairie voles are active and they tend to be more active in the day time. They are actually nocturnal. They are always seen in groups. They make nests in clumps of grass using materials that includes dry grass, sedges and weeds. What they usually do is part the grass at the ground level to make 2 inch wide runways between the entrances to their burrows. They also use grass to line their underground nests. They prefer interacting with upland prairies of Dakota. They are less active when there is a full moon. Prairie voles are herbivorous. They prefer feeding on grasses, roots, fruits, bark and some insects. They even store food in their burrows. Apart from this, they also love having clover and plantain. Prairie voles are often attacked by the predators. Predators include owls, foxes, snakes, hawks, coyotes, etc. when they notice predators are near about them, they use their underground burrows to save themselves. They have high mortality rate due to the predators. Prairie voles adapt themselves very well in the burrows. These burrows help them stay safe and secured from the predators. They are good diggers and are also good swimmers. When they feel threatened, they will stamp their hind feet. Voles normally make noise to threaten another vole. They can feel the earthly changes faster than that of the human beings. Prairie voles are generally monogamous. There mating season is in spring. During their mating season they take up individual territory and defend it from other voles. Prairie voles can reproduce any time of the year. But their main breeding season is in the fall and the spring. 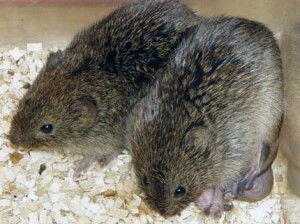 Male and female voles share nesting as well as pup raising responsibilities. But they are not sexually faithful as the pair bonded females show aggression towards unfamiliar males. Both the sexes mate with other voles if they get a chance. The female’s gestation period is between 20 and 30 days. 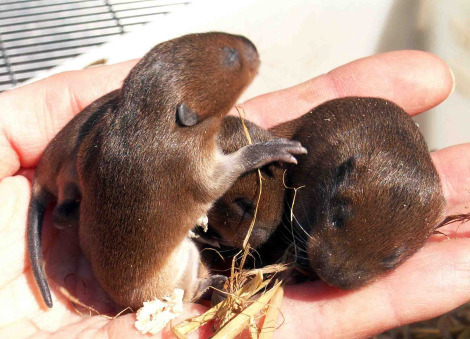 Baby voles open their eyes at about eight days after their birth. After two weeks they become capable of feeding foods. Their average longevity or life span is less than 1 year. But some live up to 3 years in captivity. Prairie voles are native animals. They can serve as desirable pets. But one should make sure that the vole is not carrying any disease that can harm you. Housing : They should be provided with a cage large enough so that they can walk and play easily. Care should be taken to keep that cage neat and clean. Feeding : They should be supplied with fruits, vegetables, roots and grasses. It is also important to provide them with proper calcium supplements. Handling : They sometimes becomes violent if are touched frequently. Don’t touch them frequently. 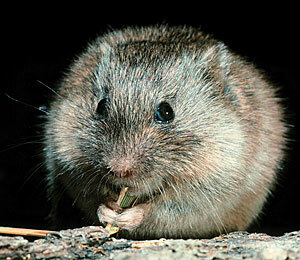 Voles are marked as endangered species by the IUCN. The species is considered secure in Arkansas, but is vulnerable in Tennessee. They make use of different postures to indicate their behaviors. They are often seen signaling a threat by raising their forefeet. They are being considered as pests to lawn, gardens and farm lands. Voles are an important food source for many predators.